The Uranus / Pluto conjunction of the mid 1960s was one of the most important astrological events of the 20th century. It was the cause of so many profound changes throughout the worlds of politics, culture, the arts and science. For Capricorn Research just about to become a teenager, the most important of all these was the invention of the miniskirt. London designer Mary Quant claimed to have originated the mini but it was actually invented by French fashion designer Andre Courreges. 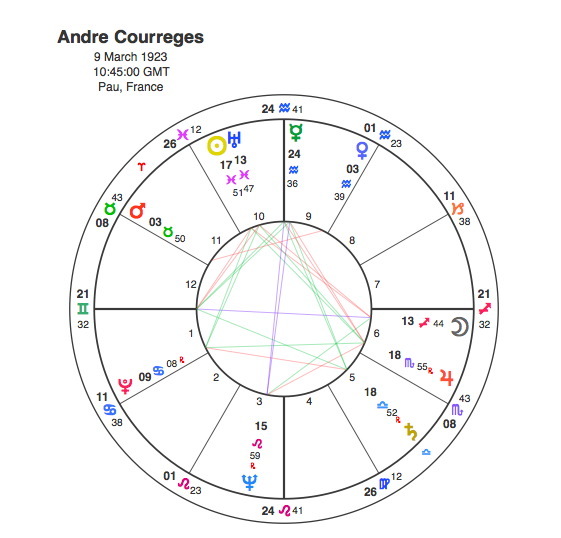 Courreges was a Pisces, slight, sensitive and mercurial in mood but if ever anyone was going to take advantage of the original and creative impact of the great conjunction it was him, as he had the Sun conjunct Uranus and in trine to Pluto. In fact these planets formed part of a Grand Trine with Jupiter. Astrology is all about being in the right place at the right time and you could say that this always applies to everyone. However if you have a Grand Trine including the Sun and Jupiter, chances are that you will benefit from your assignation with fate, far more than everybody else. In true Piscean fashion, he withdrew for a while in bitterness over fashion piracy in 1965, but returned to open his own house in 1967. That year, feeling that creativity was at a low point, he produced a spring-summer show that would make-or-break him, it was so innovative. When his models pranced down the runway in his new styles, they started a fashion revolution. The thigh-high skirts were so heart-stopping that they made the Parisian couture crowd gasp, and “la mini” was born. Within three hours of the show, the buzz swept the fashion world. Regular readers of these articles will know that Pluto’s transit to the Sun will invariably mark the watershed of a person’s life. This is even more pronounced if Pluto is in aspect with the Sun at birth. In 1966 and 67, Pluto was opposite Andre Courreges Sun. Quite possibly the most dramatic and significant single development in the history of fashion was the result. The Grand Trine features with surprising frequency in the charts of top fashion designers. Many would say this is appropriate given the innate artistic talents involved although cynics might also note the vast amounts of money earned relative to the actual effort put in. In Andre Courreges chart the aspect pattern had a classic simplicity with a point at the top of the chart. It even looks like a mini skirt.